In a world of ab lounges and vibrating tummy belts that promise to chisel your core, you’d think everyone would be walking around with a bulging six-pack. But that’s not exactly the case, is it? While getting your abs to show does require some strategy (and good genes), strengthening your core doesn’t have to be so elusive, and it definitely doesn’t require any fancy equipment or crazy core exercises for abs. You just need one simple move: the plank. An isometric strength move that requires only your body weight and a little willpower, the plank can build strength in the abs, obliques, and back. And while many abdominal moves focus on just the front portion of your midsection, plank exercises engage the entire core. A strong core can help improve posture, strengthen the lower back , and aid in many daily tasks — from putting on shoes to lifting grocery bags. Sounds pretty important, if you ask us. But if you’re looking for the best core exercises for abs, why should you ditch the fan-favorite crunches for plank exercises? Researches from the University of Waterloo in Ontario put the moves to the test to find out how isometric core exercises measure up to dynamic ones (like sit-ups). They found that isometric exercises are superior to dynamic ones when it comes to making the entire core better at it’s primary job: stabilizing the spine. Additionally, researchers from the National Institute of Fitness and Sports in Japan found that static core exercises are the most effective ways to activate the deep abdominal muscles, which also help stabilize the spine. Nobody has time for hundreds of crunches anyway, plank you very much. Even if plank exercises are the best move for the job, doing regular planks over and over again might get kind of boring. If you find that’s the case, we have some next-level plank variations that’ll really challenge you. 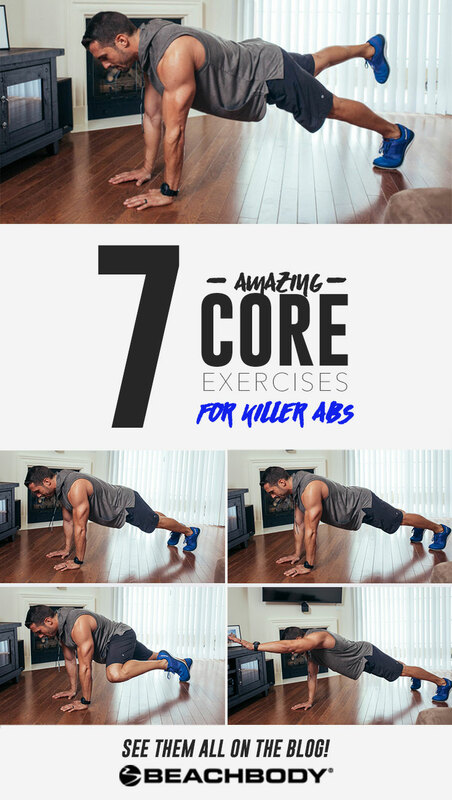 Since CORE DE FORCE co-creator Joel Freeman knows a thing or 10 about sculpting a strong core, he demonstrated some of the best core exercises for abs to help you build a core that not only looks great but keeps your whole body strong and stable, too. Before you get all fancy with your planking, it’s important to master the basic version first. Once you can hold a plank with good form for 45 to 60 seconds, then you can take a stab at different variations. How do you know if you have perfect plank form? Make sure you follow these cues. Create a solid base. Assume a push-up position with your feet together and your weight on your forearms. Your elbows should be directly beneath your shoulders. Don’t shrug your shoulders. Pull your shoulders away from your ears (toward your feet) and draw your shoulder blades together. Maintain a straight body line. Squeeze your glutes and brace your core to keep your hips from sagging. Your body should form a straight line from your head to your heels. There are many ways you can use your body weight to make the plank more challenging. You can start in either a push-up position (less difficult) or with your weight on your forearms (more difficult), unless otherwise noted. Try the following seven plank exercises to really work your core. Lift your left arm and extend it straight out in front of you. Hold for 5 seconds, and then switch arms. Continue alternating. Lift your right foot off the ground. Hold for 5 seconds, and then switch legs. Continue alternating. Position your feet slightly wider than hip width. Lift your right foot off the ground and extend your left arm straight out in front of you so that you’re balancing on your left foot and right hand or forearm. Hold for 5 seconds, and then switch arms and legs. Jump your feet apart so that they’re just beyond shoulder width. Pause, and then jump them back to the starting position. Continue, keeping the vertical movement of your hips and torso to a minimum. Lift your left foot, swing your left leg out sideways, and try to touch your left knee to your left elbow. Return to the starting position and repeat with your right leg. Continue alternating. Start in a forearm plank. Push up into a straight-arm plank one arm at a time, starting with your left. Reverse the movement to return to the starting position. Repeat, this time beginning with your right arm. Continue alternating. Start in a straight-arm plank and walk your hands out in front of you as far as possible, while still maintaining proper plank form (your body forming a straight line from your head to your heels, squeezing your glutes and bracing your core). Firmly press the palms of your hands so they are flat, and hold this position.